9/9/2008Share this story on Facebook! The Inuit, an indigenous people living in the Canadian Arctic, have a long artistic tradition that archaeological discoveries have shown to reach back thousands of years. 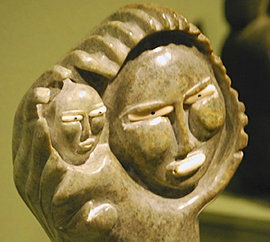 Indeed, the long and storied history of the Inuit has been preserved through their artwork. In their native dialect, Inuktitut, the word Inuit simply means “the people” and alludes to their past and present lifestyle. Despite continuing changes to their culture, Inuit remain the people of the Arctic. Though confronted by numerous transformations to their livelihood over the past 50 years, central Inuit values have endured: community, nature, and spirituality -- values we see echoed in their artistic expression. Curated by Ithaca College museology students, the exhibition highlights the distinguished collection of Mary and Fred Widding. Pivotal to the development of the Widdings’ collection is their personal relationship with the work. By sharing this collection with the Handwerker Gallery, the Widdings hope that others may discover the same connection. Exhibition: A public display of works of art or other items of interest, held in an art gallery or museum. Gallery: A room or building for the display or sale of works of art. Handwerker Gallery: Ithaca College’s art gallery located on the first level of the Gannett Center. Catalog: A description of works in an exhibition or collection giving detailed comments or explanation. Panel: A large piece of paper, usually mounted onto foam core incorporating a shorter version of the themes discussed in the catalog to be hung throughout the exhibition to help explain the arrangement of the work. Label: A small piece of paper, usually mounted onto foam core, which holds the information pertaining to the object such as title, dimension, format, year, and artist. Docent: A person who acts as a guide, typically on voluntary basis, in a museum, art gallery, or zoo. Sculpture: The art of making two- or three-dimensional representative or abstract forms, especially by carving wood or stone or by casting metal or plaster. Pedestal: A base or support on which an object or sculpture is mounted. White cotton gloves: These must be worn by art handlers whenever they touch any art object. Oils from the human skin can damage any piece of artwork, from a painting to a sculpture. You may think that getting good grades is the only key to a successful college career. But it’s not. I’ve learned that getting involved is more important and valuable than just making high marks. Like every college student, I wanted college to be a learning experience that would prepare me for “the real world.” As a photography student interested in all aspects of creating, marketing, selling, and displaying art, I got some great experience my senior year in a fall semester course that allowed me and seven of my classmates to plan, organize, and run an art show from the ground up in a real art gallery. I wasn’t exactly sure what I was getting myself into when I registered for the class, but it sounded intriguing. The class, taught by Cheryl Kramer, assistant professor of art history and director of Ithaca College’s Handwerker Gallery, showed us what it takes to put together an art show in a gallery setting: handling sculptures; writing about art for a catalog, label, or panel; giving gallery tours to groups; programming a show; and arranging work effectively in a gallery space. Thanks to the efforts of our professor, a local family offered to loan the College a personal collection of valuable Inuit sculpture to be displayed at Handwerker. Our first task was researching the background and history of Inuit artwork from prehistoric times to present practices. This task was massive; it took about half of the semester to learn the history of the Inuit people and their art before we could write the catalog for the exhibition. Go ahead and ask me anything. I’m practically an Inuit art historian now. During the semester, Inuit art historians visited the class to share their knowledge with us. We also took a trip to Cornell University’s Johnson Museum of Art to learn from their docents how to give gallery tours. Although the actual opening of the show wasn’t until the next semester, preparation and background research was key for a successful show. 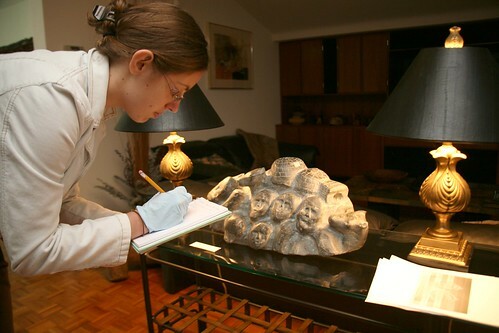 Writing the catalog, titled Of the People: Inuit Sculpture from the Collection of Mary and Fred Whidding (see sidebar), was the most time-consuming and difficult process of all. We first had to decide how best to organize about 50 works. We divided the catalog using various important themes in Inuit life: family, community, religion, and nature. Then we split into groups to write about these sections. Once everyone’s section was complete another group of student editors made the whole thing work in a cohesive manner. We then split into other working groups. I was in the programming group, which was in charge of any event that might happen with or in the exhibition. For instance, we initially wanted to screen a film about Inuit life alongside the artwork, but copyright laws stood in our way. So instead, we had a private screening of a film followed by a discussion, which was open to students and the public. We also gave several tours to classes and outside organizations and members of a local assisted-living community. As for installation, that group had to consider the themes of the show as well as the size of the pieces. We secured pedestals to hold and project objects, keeping in mind the space allotted to us. Scale was a challenge because we had only seen the pieces in person at the beginning of the fall semester. The objects were delivered to the gallery a week before the show opening and the installation team toiled for days over their placements. But in the end, the display was beautiful and flowed quite nicely throughout the space. 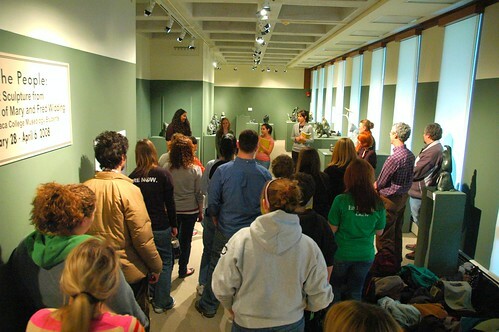 Visitors listen as students describe the process of curating an art exhibition. Being involved in this class taught me about the importance of patience and teamwork. I also vastly increased my public speaking skills owing to the various tours I gave in the gallery. We did the majority of our preparation during the allotted fall semester, but the work continued well into the spring when the show opened. The class was tough but a great learning experience. The catalog we published was a hit and is even going to be used as course material in another art history class on campus. Two other students and I were also asked to speak about our experience at the Whalen Symposium, a daylong event featuring presentations on research that students have conducted. The vast success of our show reflected very positively on our professor as well as on the art history department because this kind of course had never been offered before. I think I want to stick with art-making instead of the art-hanging side of things after college. But this class helped me understand the gallery setting inside out, and I can use that knowledge when searching for galleries to display my work. The class has already helped one of our classmates. She graduated in December and got a curatorial job in a gallery in Hawaii specifically because she had curatorial work experience. There’s no substitute for learning by doing, and the successful hands-on work of this class provided me with valuable experience and knowledge. I could ace all of my photography classes and earn praise for my photographs, but none of that would take the place of what I gained by stepping outside of the lecture hall. In the end, the blood, sweat, and tears were well worth it.